In 1976 my father died of a sudden heart attack. He was only 54 and had just taken early retirement hoping to spend some peaceful years with my mother at a small home he had built in northern Michigan. He was a smoker, but no more than many that live far beyond his years. He was physically active and not overweight. My mother was from a farm and always prepared varied and wholesome meals. We used oleomargarine because my folks couldn't afford butter, and because it was common knowledge that butter caused heart disease. His death was needless. The family he left behind suffered needlessly. We all were in shock at the news. My mother was lost without him and never really recovered. When I received the call that he had just died, the life went out of my legs and I collapsed in grief. I had just finished many years in college away from my parents. Working my way through and trying to be a father to my first two children while doing so was consuming. There was little time to think of parents. Life was full of so many prospects and it was easy to be self absorbed. My suffering was regret that he lost so much potential life, but also about my missed opportunity. I didn't have a chance as an adult to get to know my dad, give him respect, and thank him for all his hard work supporting the family, to enjoy his wonderful humor and quiet wisdom, to apologize for moaning about chores at home and laugh with him about the paybacks as my children did the same to me, to take him out to dinner and pay for it, to share my children with him, to share with him accomplishments that would make him proud of his son, to admit to him that he was right when I was so sure I knew so much better, to help him in any way I could to make his life easier and more enjoyable. I missed giving to him. I did not want to leave him with just the memory of me as a child, a taker. Would've, could've, should've. Heart disease robbed us all of a wonderful person and of opportunity to love and thank him. Heart disease is about the millions who suffer and die each year and the suffering that is left behind. In the decades since his death, I have learned there can be an end to it all. Virtually every health malady modern humans and domesticated animals face can be traced to ignoring the inextricable link between life and nature. Unfortunately, since we rely on technology for so many of our comforts and conveniences, we have come to believe its machines and drugs are also the intermediary between us and health. We have forgotten an immutable truth: All living things function properly only if they are provided the fuel and environment that match their genetics. Fish out of water fed grass get sick and die. Cows underwater fed shrimp get sick and die. Each creature is designed for a specific habitat and food. To the degree this simple truth is ignored, sickness results. That is so fundamental that it seems silly to even point it out. Nevertheless, this common sense is by and large ignored by both the public and the medical professions. Our love affair with and immersion in modernity is in large part responsible for this blindness. Instead of looking to nature for the solution, we play victim and blame it for our misfortunes. Then we look to technology to fix health problems over which we supposedly have no control. 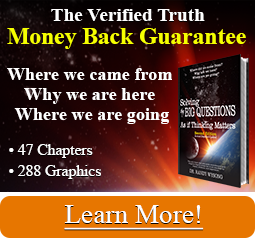 You've heard the tired old reasons for why we get sick: our disease is in our genes, it's just the way the dice roll, we are being attacked by viruses or bacteria, advancing years is the problem,…or, we didn't get our yearly checkup or stay on our meds. The modern enlightened solution to health problems is to treat the body as a machine we comprehend completely and can manipulate and rearrange at will. But what we really know about biology, life, and disease is a drop in the ocean. This flawed materialistic starting philosophy and heady presumptuousness lead to the prevailing medical paradigm of managing laboratory numbers, attempting repair, and assuaging symptoms. The true underlying causes are not recognized or addressed because they are bigger, more holistic, than a readout or picture a clinical machine can produce. We pay a heavy price in misery and death from this irrationality. For example, cardiovascular (heart and artery) disease kills one out of every two in developed countries, and seventeen million worldwide annually. The economic toll, grief, pain, broken families, and ruined dreams that result from this human devastation are incalculable. An airplane crashes and kills three and it is in the headlines. Soldiers die in a war and the toll is constantly calculated. A princess dies in an automobile crash and the media buzzes about it for years. But seventeen million die from a preventable and medically aggravated (as you can learn) disease every year, but barely a whisper. Why are network anchors not screaming from their rooftops? Because everyone assumes what can be done is being done and that the real problems are a lack of government action, inadequate medical access, insufficient funding for research, not enough vaccines, evil insurance companies, people not getting yearly checkups, and drugs that are too costly. This popular buzz about disease and health is by and large a dog and pony show. We are not victims. Technology and money are not the cures. Modern medicine is not taking us to the finish line of cure and health, but rather running us in place, if not making us fall backward. Seventeen million deaths each year are by and large easily preventable by people doing simple, ordinary, and inexpensive things. Why is that not in the headlines? Because it would create no industry, no advertising dollars, no reliance on experts. Besides, replacing a multitrillion dollar pharmaceutical-medical profit center with something people can do for themselves, at essentially no cost, is just too absurd. I would like to prove to you that it is not.